The tradition of hot cross buns dates back to the 16th century with monks baking rolls to honor Easter and marking the tops of rolls with a cross. They made the cross by using a sharp knife cut on the dough before being baked. Later, the cross was made with additional strips of dough placed on top of the rolls or buns, and now most rolls are decorated with icing in a cross pattern after baking. It is said the rolls contain spices ( cinnamon, cardamom, allspice, etc) in remembrance of the spices used to treat Jesus’ body for burial. Hot Cross Buns were traditionally served on Good Friday, the Friday just prior to Easter Sunday. The buns cost more than a penny now! In most bakeries they cost anywhere from $1 to $3 each, but you can make them for less than $3 a dozen. That’s a quarter per bun. Not a penny, but fairly reasonable! We celebrate Easter in our home with a family brunch, or a dinner after church. This year, instead of making our traditional orange rolls, I’m making Homemade Hot Cross Buns. We are a family steeped in food traditions, so wish me luck! 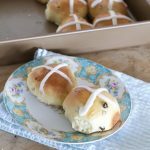 I’m guessing most of our family will love this recipe for Homemade Hot Cross Buns, so they won’t complain when they sink their teeth into one of these soft, sweet rolls. I love this recipe because it is in between the traditional dinner roll and a sweet roll. Sweet, without being too sweet. Perfect for any dinner or brunch menu. Hot cross buns are sweet, with a bit of spice, a few currants and topped with an icing cross. If you love rolls and sweet rolls, you’ll love this recipe for Homemade Hot Cross Buns. You may want to double or triple this recipe. One recipe makes a dozen, and most people will want at least one bun. Homemade hot Cross Buns are a simple dough recipe, no rolling out or filling- just shape the dough with your hands and place in the pan. After baking, top the rolls with a simple icing and enjoy! Give the recipe a try early in the week so you can taste for yourself. If you’re like me, you’ll have a new found tradition. My Mom made the best Hot Cross Buns ever! I have never found any like them. They had a lemon extract, and mace flavoring to the dough and she always added chopped pecans or walnuts and candied fruits to the dough. She topped them off with either frosting crosses or just a simple cinnamon sugar and mace mixture. after cutting the rolls on the top in a cross prior to baking. I miss them so much. I have made them many times but the family is not into candied fruits, so I will have to use craisins and other dried fruit, but it will not be the same! Easy to follow recipe and yummy! 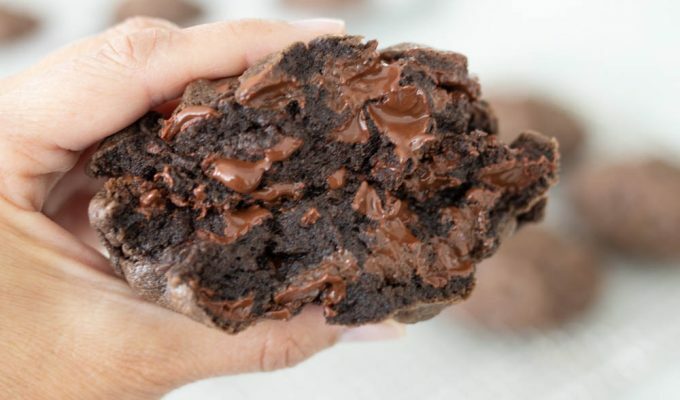 Will definitely be making these again! Thanks Clarisa! I so appreciate your feedback! Scrumptious! I didn’t have powdered milk so I decided to chance it and substitute a little over a cup of whole milk instead. They turned out perfect! Kids loved them! I’m so glad this recipe got the “two thumbs up” from the family! Thanks for reading ABK and thank you for your positive comments.